Emory University announced today that Jonathan S. Lewin, MD, has been appointed executive vice president for health affairs. Lewin also will serve as executive director for Emory's Woodruff Health Sciences Center, president and CEO of Emory Healthcare and chair of the Board of Directors of Emory Healthcare. He will begin his tenure at Emory on Feb. 1, 2016. "We are delighted to welcome Dr. Lewin to the Emory leadership team," says Emory President James W. Wagner. "Dr. Lewin joins us from Johns Hopkins Medicine with an impressive track record of innovative and high-impact research, exceptional patient care and visionary administrative acumen. His insights as a leader, clinician and researcher will benefit our patients, faculty, students and staff, as well as the state of Georgia and beyond." Lewin currently serves as senior vice president for integrated healthcare delivery and as co-chair for strategic planning for Johns Hopkins Medicine. He also serves as professor and chair of the Russell H. Morgan Department of Radiology and Radiological Science at Johns Hopkins University as well as the radiologist-in-chief at Johns Hopkins Hospital, with secondary appointments as professor of oncology, neurosurgery and biomedical engineering. "I am humbled and honored to have the opportunity to join such a strong leadership team and to be a part of a truly exceptional university," says Lewin. 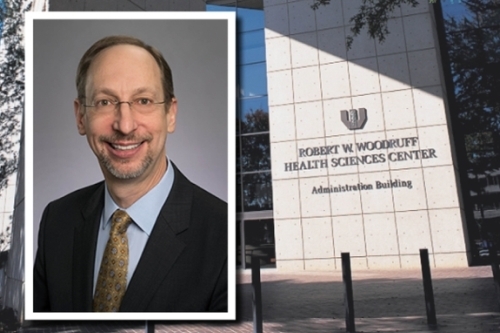 "It is exciting to join the outstanding faculty and staff of Emory's Woodruff Health Sciences Center and Emory Healthcare in educating tomorrow's health care workforce, pursuing discovery and innovation in the health sciences, and providing skilled and compassionate care to our patients." Before joining Johns Hopkins, Lewin was the director of the Division of Magnetic Resonance Imaging and vice chairman for research and academic affairs in the Department of Radiology at Case Western Reserve University and the University Hospitals of Cleveland. Lewin earned his undergraduate degree in chemistry from Brown University in 1981 and his Doctor of Medicine from Yale University in 1985. He completed his internship at Yale-New Haven Hospital and his residency in diagnostic radiology at University Hospitals of Cleveland as well as a magnetic resonance research fellowship in Germany, a neuroradiology fellowship at the Cleveland Clinic, and additional training in head and neck radiology at the Pittsburgh Eye and Ear Hospital. Lewin is a Fellow of the International Society for Magnetic Resonance in Medicine and of the American College of Radiology. He currently serves, and will continue to serve, as president of the American Roentgen Ray Society (North America's oldest radiology professional organization), president of the International Society for Strategic Studies in Radiology, president-elect of the Society of Chairs of Academic Radiology Departments, and immediate past-president of the Association of University Radiologists and of the Academy for Radiology Research. Lewin is internationally recognized as a pioneer in interventional and intra-operative magnetic resonance imaging, and he has published approximately 200 peer-reviewed scientific manuscripts, more than 60 chapters, reviews, commentaries and other invited papers on a wide range of topics, including the science and clinical aspects of interventional magnetic resonance imaging, head and neck imaging, magnetic resonance angiography, small animal imaging, functional brain imaging, and the imaging of acute stroke. He has developed more than 20 patents, and has been principal or co-principal investigator on more than $10 million in grants from the National Institutes of Health (NIH) and other federal and state funding agencies. He has also served on numerous national committees, editorial boards and grant review groups for foundations, the NIH, and as a member of the NIH task force on minimally invasive cancer therapy. Dr. Lewin's appointment follows an extensive national search. The search committee was chaired by Claire Sterk, provost and executive vice president for academic affairs at Emory.